“ Beauty lies in the eyes of the beholder .” So true are the words. But beauty is still something else. Beauty lies in our hearts too. Beauty lies in relationships and the way we interact with other people. Beauty is there in every small thing only that everyone doesn’t see it .Today I’m going to tell you one of the most beautiful stories of my life.. about my friend Jhum and my Dove. I still remember that day when I first met Jhum. It was my first day in school. I was a brave little girl and hated crying. While all the other girls in the classroom were whining I sat there silently contemplating their moves and way of crying. Suddenly a very cute girl with chubby cheeks and a pony tail entered and sat beside me. She smiled at me and immediately I felt that she should be my friend. That was the day ! From then on we’re like soul-sisters . 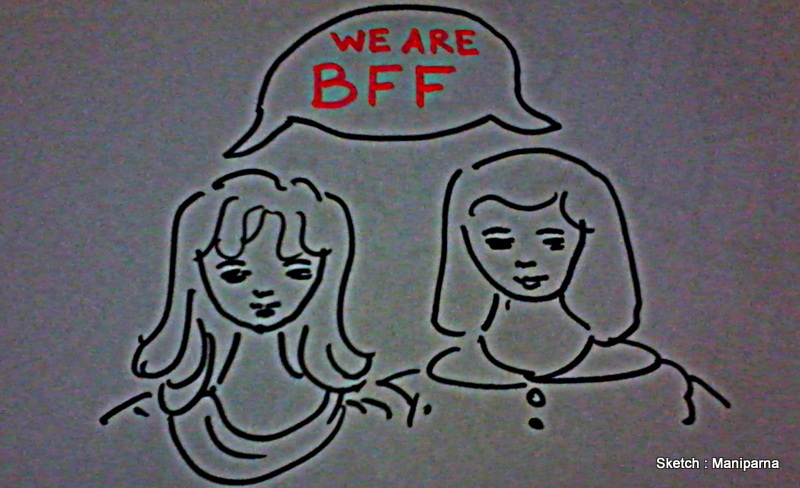 We used to eat together during the recess , played together and even helped each other in the study. Teachers said that we were ‘glued’ . But by nature, we were poles apart. She was a cute,little baby, with all necessary girlish charm, innocent and introvert….. and me ? I was somewhat tom-boyish..hated to brush my hair properly or wear any girly outfit. My favourite dress outside the school was jeans and shirt. Jhum used to look at me scornfully sometimes. On her seventh birthday, I remember, she insisted her mother to buy a dress for me similar to her . And after much quarrel and a skirmish, I agreed to wear that fancy fairy dress ( much to my Mum’s surprise , though she was very happy). ” Yes, and as the college fest is approaching fast..just a week left and your skin looks dull so you’ve to use it too from today ….got it ? ” she sounded menacing . ” WHAT ! are you crazy?? have you gone out of your minds ? I don’t even have the least idea about how to put a make -up or anything and ..and..I don’t look pretty “..I added . I stood there , flabbergasted . I had no idea what to say so that I can counter her. I just asked ” why Dove ? ” .. I trusted her .. as always , and guess what happened ? I used the Dove beauty bathing bar regularly for that remaining days to the pageant and actually I could feel the difference. My skin looked so glowing and soft ! It not only enhanced my beauty but also provided the required confidence and self-esteem regarding my looks. And to cut a long story short , I was crowned as the 2nd runner up in the contest . My bonding with Dove thus traced back to my college days. From that day onward I use no other soap but Dove. 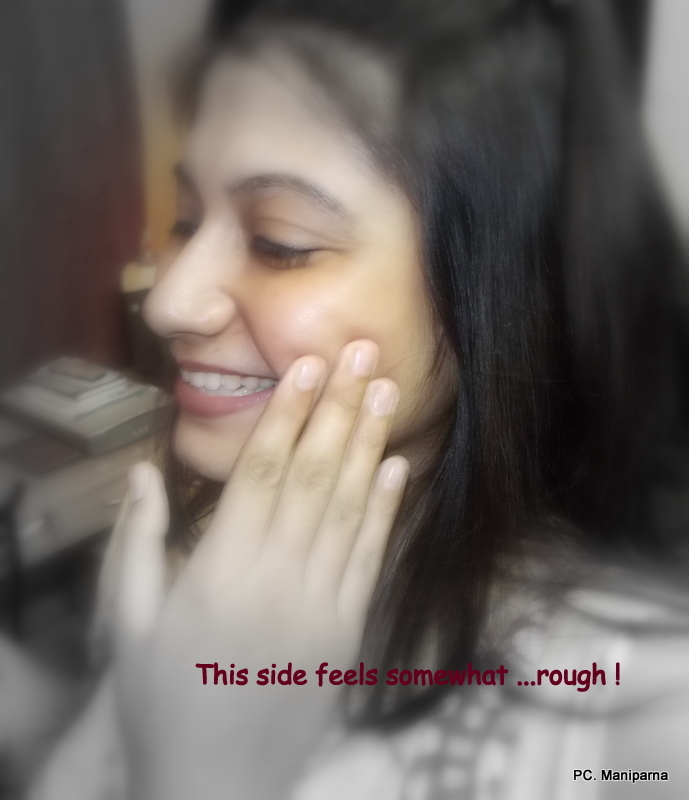 Pampering my skin and to give it the essential nourishment and hydration has been so easy with Dove. It’s a part and parcel of my beauty regime and my existence without Dove will not be complete. Jhum is also a die-hard fan of all the Dove Products . So, when we heard about the Dove Guessing Game With My Friend contest we actually became supercharged. There were ample reasons for our over-enthusiasm . Dove being a part of our friendship and life , we feel that we are a trio…Jhum-Dove-Maniparna. We’ve caused many a heart to break..the three of us ! 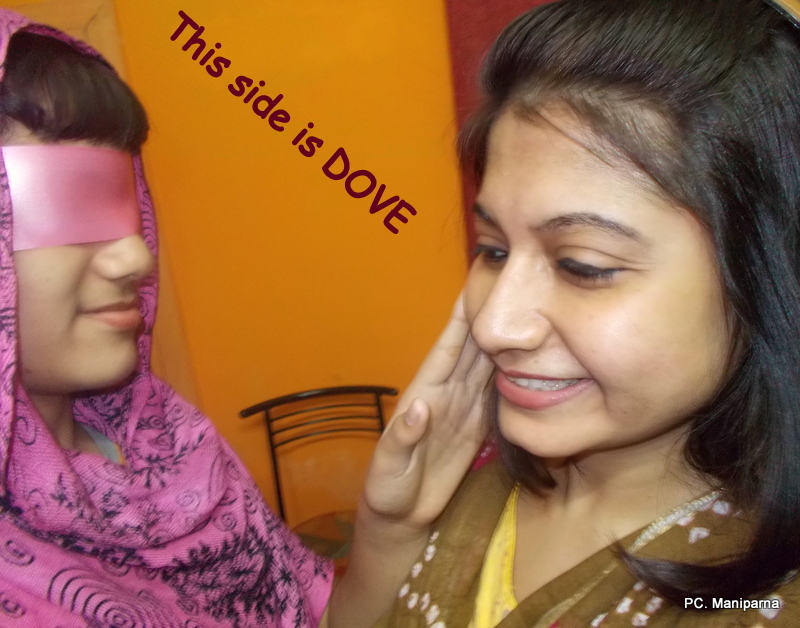 So, one fine morning after getting the #DoveFaceTest kit I called Jhum up and invited her to spend a day with me . Both of us were excited because we seldom get time nowadays to sit together for some gossip , coffee and snacks. The extra attraction was to take the #DoveFaceTest. For that I deliberately stopped using Dove on my both cheeks for a few days. It was obvious even to me that the left cheek was becoming rough comparatively..I could feel the absence of moisture on it myself . The door-bell rang exactly at 11.30 am. (Jhum is very punctual about appointments from her very childhood. She still maintains this gesture.) I welcomed her and she hugged me . She also brought my favourite sweet “Nolen gurer sandesh” ( a typical Bengali sweet) . We kept on chatting for hours. We laughed a lot remembering our good, old days and pranks we used to play on guys. The reminiscence of old days mellowed our minds . Really , a good company , a rendezvous with an old friend is so rejuvenating ! Then came the ” test” time. I blindfolded Jhum using the nice pink satin ribbon which was there in the kit along with two Cream Beauty Bathing Bar. I had no confusion that it would be a child’s play for her and I proved to be absolutely right. She just touched both of my cheeks once and immediately inferred that the left cheek was Dove-less . Wow ! she ( and Dove too) passed the test with flying colours. And why not , after all , through all these years Dove has taught us to choose between the right and the wrong when it comes to the selection of beauty products. Dove is not a soap, it’s a friend for a lifetime. Sodium Cocoyl Isethionate, Stearic Acid, Sodium Palmitate, Water, Lauric Acid, Sodium Isethionate, Sodium Stearate, Cocamidopropyl Betaine, Sodium Palm Kernelate, Perfume, Sodium Chloride, Titanium Dioxide, Zinc Oxide, Glycerin, Tetrasodium EDTA, Tetrasodium Etidronate, Citric Acid. It has one of the gentlest of formulae for a soap that not only makes your skin look glowing,soft and silky but also gives you that confidence and charisma to find your place in the world. My companion for life….. Dove . And another thing I must mention, not only the Dove soap, I can act as a protagonist for any campaign which includes other Dove products like Dove Shampoo, conditioner , Dove Essential Nourishment and Body wash Creme. Just have a look at those products here in this website and surely you’ll fall in love with them. I’ve started using Dove Elixir Hairfall Rescue Hair oil and it’s just another amazing product from the house of Unilever. Dove is actually a brand that helps women to realize their individualistic potential when it comes to beauty . Never makes me feel low. 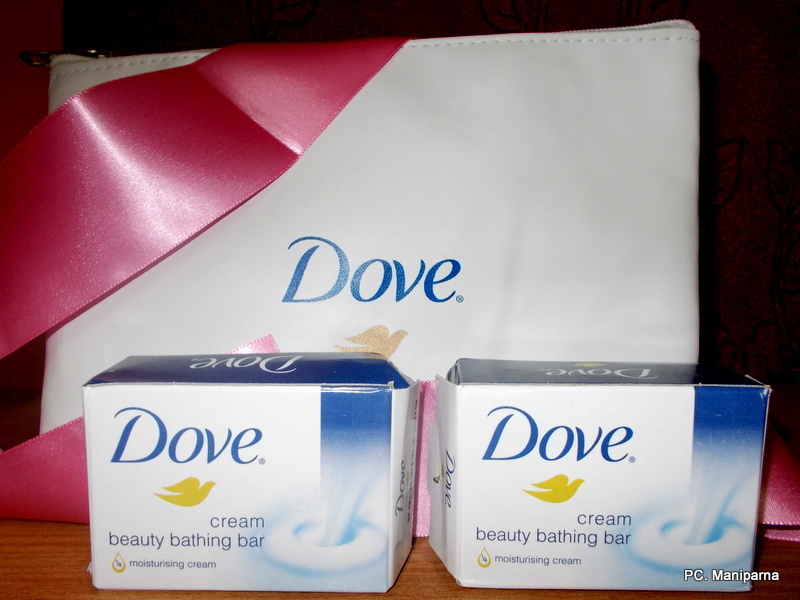 Last but not the least, I’m really thankful to Indiblogger and Dove for sending me the #DoveFaceTest kit which added more to the fun and enjoyment we had together. Thanks DOVE for being my friend. Great illustrations & real pics! U & Jhum look nice together! Cheers to your friendship & Dove! Yeah Bhabya ..thought that would be a fun to play the game 😀 and really it was ! Such a sweet post… Friends are indeed the most valuable jewels one can have.